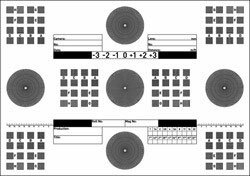 This focus test chart has been developed for combining benefits of different other test charts in one and for complying the requirements of assistant cameramen and focus pullers when doing a technical camera test. That has been achieved e.g. by using Siemens stars with 98 pairs of sectors. In cooperation with FGV Schmidle* GmbH, Munich the test chart has been further optimized and extensively practically tested. It is similarly fit as well for evaluating focus through the view finder of the camera as for assessing camera test films by watching on a projector or Locpro, in telecine or by magnifier/microscope on a light-table. The gradation of the graphical patterns is based on US MIL-STD-150A, Section 5.1.1.7, a standard which is used e.g. for assessing the resolving power of telescopic sights of the US Air Force. 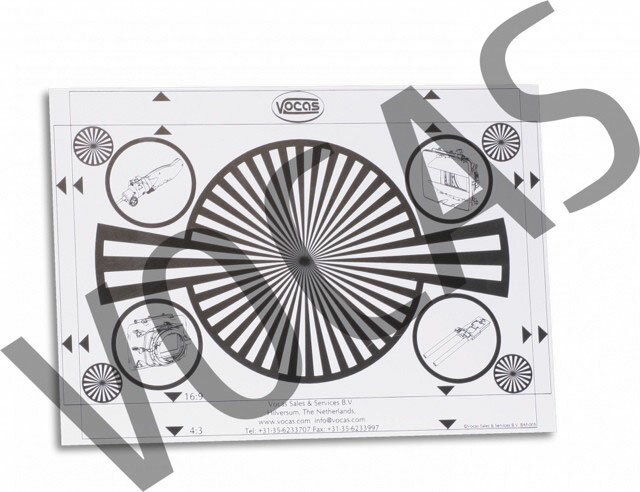 The surface of the focus test chart is silk-matt cellophane coated for being tough and wet-wipeable and for being indestructible by adhesive tapes. 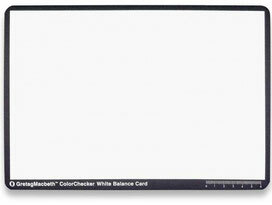 Moreover there are clearly writable areas which can be inscribed by dry-wipeable board markers thanks to an additional film coating on this areas. In both sizes the scaling of the graphical patterns is the same, just the size and the arrangement of them is different. Material: Paper 250g/sqm, light-toned white, silk-matt cellophane coated, writable areas additionally film coated. 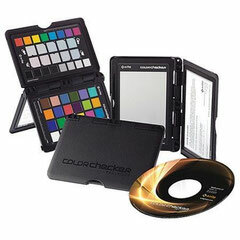 ColorChecker Passport RAW COLOR POWER Control and Creativity from Capture to Edit. Reduce your image processing time and improve quality control in your Raw workflow by combining the powerful color capabilities of the ColorChecker Passport and Adobe® Imaging solutions. The ColorChecker Passport allows you to quickly and easily capture accurate color, instantly enhance portraits and landscapes, and maintain color control and consistency from capture to edit. 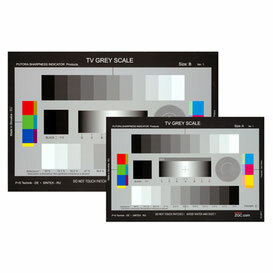 Superior color results in a fraction of the time with X-Rite ColorChecker Passport! ColorChecker Passport is a powerful 'capture to edit' color solution for any photographer looking for more accurate, consistent color and creative flexibility. And when you combine ColorChecker Passport with Adobe® Imaging solutions you'll gain even greater benefits. ColorChecker Passport combines three photographic targets into one pocket size protective, self-standing case that adjusts to any scene. Together with the included camera calibration software, you get the ultimate in functionality, flexibility and portability. There are so many ways to incorporate X-Rite ColorChecker Passport into your Raw workflow. Whether you take advantage of the entire solution, or just a couple of ColorChecker Passport's many features, you'll realize improved quality and productivity almost immediately. You'll still gain many great benefits when you include ColorChecker Passport in your workflow. 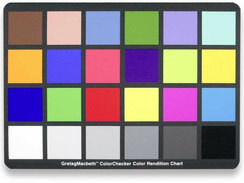 The ColorChecker® 24 Patch Classic target is an array of 24 scientifically prepared natural, chromatic, primary and gray scale colored squares in a wide range of colors. Many of the squares represent natural objects, such as human skin, foliage and blue sky. Since they exemplify the color of their counterparts and reflect light the same way in all parts of the visible spectrum, the squares will match the colors of representative sample natural objects under any illumination, and with any color reproduction process. ColorChecker Classic can also be used to create a white balance with your digital camera to guarantee precise, uniform, neutral white under any lighting condition. To compare digital reproductions to real life scenes or test targets, simply include ColorChecker in your first photo if you’re shooting JPEG or traditional, or any photo in the series if you’re shooting RAW. Later, in the studio, use it to compare, measure and analyze differences in color reproduction in any color rendition system. This objective standard will help you avoid costly mistakes and trial-and-error color correction after the fact. If you’d like to create color profiles for your digital camera and take your digital photography to the next level, consider the ColorChecker Classic. Array of 24 natural object, chromatic, primary and gray scale colors, arranged in four rows. Each square reflects light the same way as its real-life counterpart in all parts of the visible spectrum, under any illumination, and with any color reproduction process. The ColorChecker Gray Scale card is a full size version of the white, 18% gray and black reference squares used in the standard 24-patch ColorChecker. This target is scientifically engineered to provide a precise uniform surface that is spectrally neutral (reflects equal amounts of red, blue and green) in all lighting conditions. Using the ColorChecker Gray Scale. Photographers can use the ColorChecker Gray Scale as the first reference shot in a series to easily correct image color under most lighting conditions by balancing on the mid tone gray value. For the studio photographer, the ColorChecker Gray Scale lets them quickly set up the proper studio lighting ratio between main and fill lights for capturing accurate color without a lot of after-the-fact manipulation. 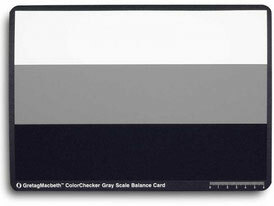 In addition, the ColorChecker Gray Scale provides reference values that can quickly be checked and used to adjust colors within most common photo processing software packages. Provides reference values to check and adjust colors. Allows you to instantly correct color images by setting the mid-tone gray value. Enables quick setup of proper studio lighting ration between main and fill lights. A white, 18% gray and black target all on a single card makes color adjustments faster and easier with your photo processing software. Digital Photography: Check images, output, monitors. Digital Imaging: Check scanners, monitors and proofing devices. Cinematography: Television and Video: Check cameras, monitors, lights and film. The ColorChecker Custom White Balance target delivers accurate white reproduction. As lighting conditions change, your camera shifts the way it reproduces white; resulting in color shifts in your photos. Most white balance targets aren’t neutral and could cause colors to shift under different lighting conditions. But the ColorChecker Custom White Balance target is a scientifically engineered, absolute neutral white reference that prevents color shifts and provides precise, uniform surface that is spectrally neutral – in any lighting condition. That means you can be confident your camera’s image is as close to real life as possible. ColorChecker White Balance also gives you a way to adjust your digital camera's color sensitivity to exactly match the ambient lighting conditions; in effect, change what that the camera “sees.” The perceived color of white changes based on ambient conditions—outdoor it is perceived to be cooler, indoor it is perceived to be warmer, and under fluorescent light, greener. Even in a controlled studio environment, this can be a problem. Whether on location or in your studio, establishing an accurate custom white balance before each photo session ensures accurate colors from the start. pecifically designed to meet the needs of digital photographers, the Digital ColorChecker SG target includes the highest quality color reference standards available. Each of the 140 patches was chosen for its location in color space to expand the color gamut, so you can create profiles that capture the full capabilities of your digital camera and scanner. 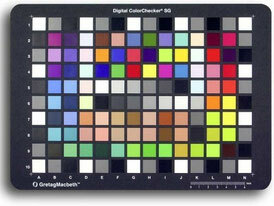 The ColorChecker Digital SG target includes the colors from the standard ColorChecker target, many of which represent natural objects, such as human skin tone, foliage and blue sky. Additional skin-tone reference colors deliver greater accuracy and consistency over a wide variety of skin tones, and gray scale steps provide accurate control of camera balance to maintain a neutral aspect, regardless of light source. Digital ColorChecker SG can also be used to create a white balance with your digital camera to guarantee precise, uniform, neutral white under any lighting condition. ColorChecker Digital SG provides the same great value as the ColorChecker Classic o compare digital reproductions to real life scenes or test targets. The ColorChecker Digital SG takes a step beyond the traditional ColorChecker by representing a larger gamut and providing greater refinement of individual colors. Simply include ColorChecker Digital SG in your first photo if you’re shooting JPEG or traditional, or any photo in the series if you’re shooting RAW. Later, in the studio, use it to compare, measure and analyze differences in color reproduction in any color rendition system. This objective standard will help you avoid costly mistakes and trial-and-error color correction after the fact. Use to create custom ICC profile of your camera*. Cinematography: Television and Video: Check cameras, lights and film. *When paired with camera profiling software, such as i1Match or ProfileMaker 5 Digital Camera modules, ColorChecker Digital SG can be used to create an ICC profile of your camera. By implementing a complete color managed environment for your input and output devices, you’ll gain the most from your digital photographic workflow. Pair with camera profiling software to create a custom ICC profile of your camera. 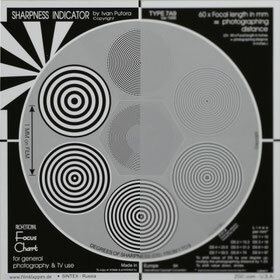 The Sharpness Indicator is the most advanced and accurate test chart available. Any photographer will be able to accurately evaluate the sharpness and resolution of all types of motion picture, video and still camera. The Sharpness Indicator is made up of test-targets with concentric circles printed on a Reference Field Level background. The background has the same reflectance as the average reflectance of the targets. When a target appears to blend with the background, it indicates that the target is beyond the sharpness of the system being tested. The concentric circles that make up each of the test targets on the Sharpness Indicator are calibrated in the degree of sharpness (DS). The standard set up distance is 60x the focal length of the lens being tested. 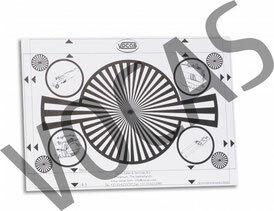 The chart is supplied mounted on foam board and framed. 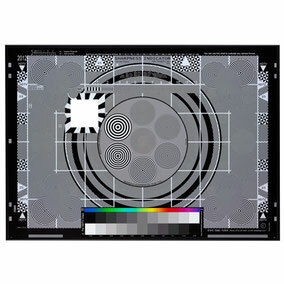 The Sharpness Indicators TV Test chart are made up of test-targets with concentric circles at various frequencies printed on a Reference Field Level background. The gray background has the same reflectance as the average reflectance of the targets. When a target appears to disappear and blend with the background, it indicates that the target is beyond the sharpness of the system being tested. Because the targets 'pop' into focus, this system is far superior to standard Air Force bar-type charts. 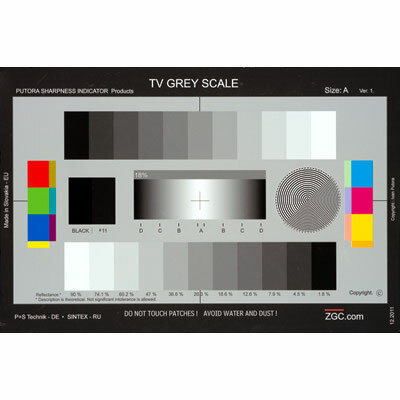 Now available in two size 12"x8" & 15 1/2" x 10 1/2"
Contrast Indicator neighbored by a strip of 18% grey (in the center), a Sharpness indicator's elements, full black, basic colour patches and all of it is on the grey background "Reference Field Level", established by Ivan Putora's Theory. Charts are MATTE to make it easy to work with a wide range of lighting conditions. Charts are supplied in vinyl envelope. In addition to the 11-step scale, the chart incorporates several other useful components for visual evaluations: Contrast Indicator neighbored by a strip of 18% grey (in the center), a Sharpness indicator's elements, full black, basic colour patches and all of it is on the grey background "Reference Field Level", established by Ivan Putora's Theory.